John Voelcker April 26, 2014 Comment Now! 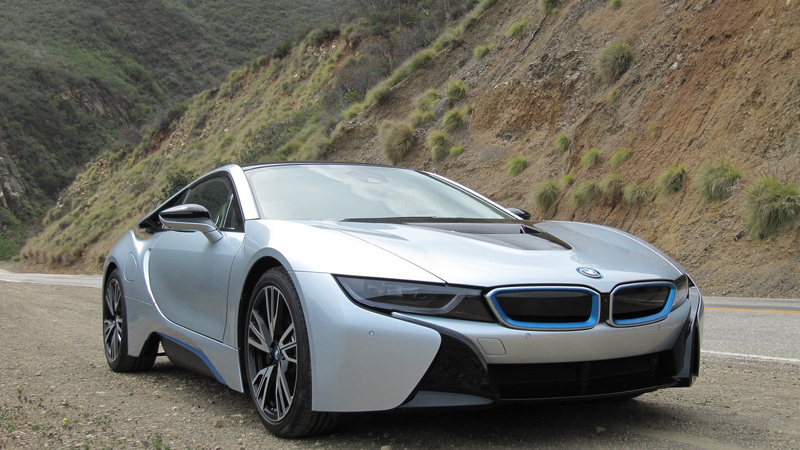 The 2015 BMW i8 plug-in hybrid sports coupe is a striking design that draws attention wherever it goes. Park it on the street, and you'll be swarmed by pedestrians with cellphones, taking pictures in reverent silence. Tell them that it's a range-extended electric car--capable of traveling 10 to 15 miles on electricity alone, then supplementing its small three-cylinder engine with electric "boost"--and they're even more impressed. That's the case in Los Angeles, anyhow, where plug-in electric cars enjoy a variety of financial incentives as well as carpool-lane access. Over a day-long drive of roughly 100 miles that included city traffic, a short stint on the freeway, and then a delightful two hours of carving up the twisty roads in the canyons above Malibu, BMW's newest performance car revealed two very different personalities. It can be a quiet all-electric car on short trips, with decent if not exceptional acceleration and the calm lack of vibration that sets electric cars apart from their gasoline-engined counterparts. Then there's the performance coupe with a small but powerful turbocharged engine supplemented by substantial electric torque under full acceleration. And the driver can choose which mode to use for any given trip--something other cars in the BMW i8's price range can't offer. Between the rear wheels sits the 231-horsepower turbocharged 1.5-liter three-cylinder engine, producing 236 lb-ft of torque and powering the rear wheels through a six-speed direct-shift gearbox. The front wheels are separately powered by a large 96-kilowatt (131-hp) electric motor. The i8 can be driven electrically by its front wheels, in gasoline-hybrid mode by its rear wheels, or in all-wheel drive by using both powertrains at once--controlled by a very great deal of software to keep all the pieces operating harmoniously. Using both parts of the powertrain together, maximum output is 362 hp and BMW quotes a 0-to-62-mph time of just 4.4 seconds. 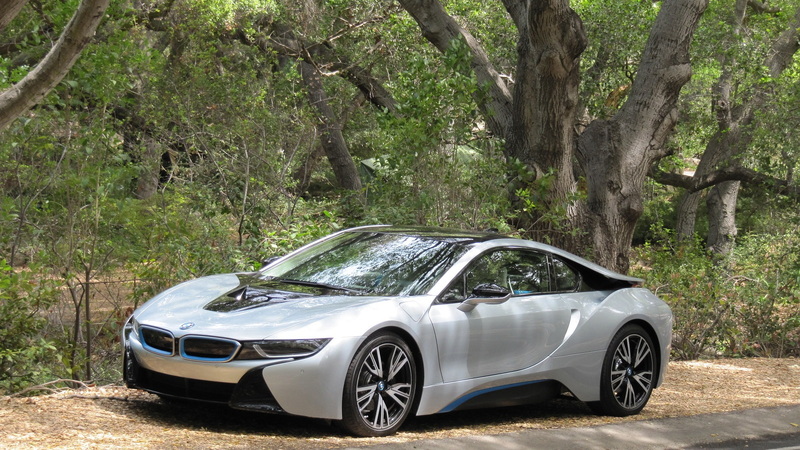 The i8 offers three different driving modes. The "Max e-Mode" setting keeps it in all-electric mode up to freeways speeds of 75 mph, giving somewhere between 12 and 20 miles from the 7.1-kilowatt-hour lithium-ion battery pack fitted in the tunnel between the two front seats. Once the pack is depleted, the i8 segues into "Comfort" mode, in which it acts fundamentally like a hybrid car: It will start off on electric power, then switch on the engine when more power is required. In this mode, the engine recharges the battery pack only enough to keep the battery at enough charge to act as a hybrid. Switch over to "Sport" mode by pulling the shift lever toward you, however, and the BMW i8's whole personality changes. The instruments turn red, replacing the power meter with a tachometer, and an entirely different version of the powertrain management software takes over. In Sport mode, flooring the accelerator will activate the front electric motor--illuminating a "Boost" notice in the tach--and give the car that 4.4-second acceleration to more than 60 mph. 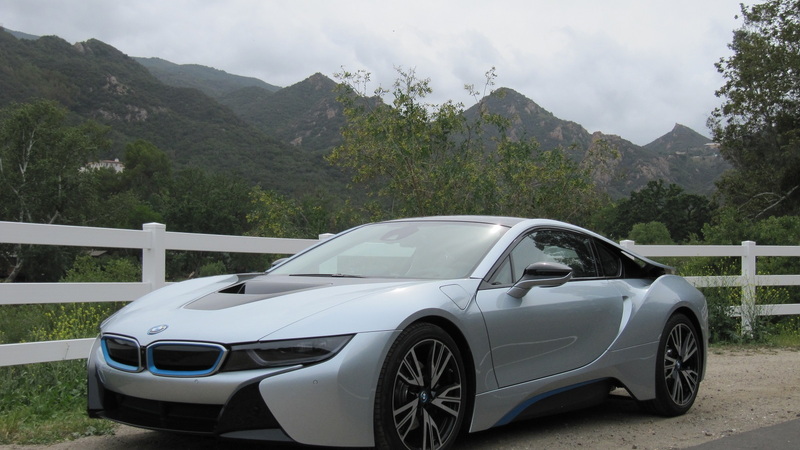 On the twisting canyon roads above Los Angeles, the BMW i8 pulls aggressively and delivers a pleasant howl from the engine mounted transversely behind the passengers. Handling is neutral, and the electric power steering is precise and delivers decent feedback considering that everything the driver feels through the wheel is simulated. (For road feel, the now-vanishing hydraulic power steering can't be beaten--in our view--but it's simply not compatible with a car that runs some of its miles on electricity alone..
We did experience a couple of discontinuities somewhere in the mix among power delivered to the front wheels and the rear wheels, low-speed regenerative braking, and traction control software that tried to manage all of it. In one case, for instance, slow deceleration toward a stoplight in electric mode followed by a quick power-on/power-off transition produced an unexpected lurch forward. But these instances were rare, and we suspect BMW will refine the control software to tune it for those "edge case" situations. Then there's the sound produced by the powertrains, both inside and outside the car. BMW has tuned the sound of the engine output, via a sound-generating chip that adds frequencies to the engine note based on engine speed and how fast the car is traveling. On upshifts in Sport mode, there's a nice honk through the exhaust system before the engine settles down to its new, lower speed. But it's important to understand that the BMW i8 is a touring car, not a track car. It's priced in line with cars like the Audi R8 and Porsche 911, but it's a very different kind of car--one meant for use around town in electric mode, and then stretching its legs with the gasoline engine when performance that begins to approach the racy looks is desired. While BMW will likely sell every i8 it sends to the U.S.--just 1,000 the first year, and likely no more than 5,000 a year after that--it remains to be seen if its remarkable looks and split personality will win it enough fans to justify the price tag. But until that question can be answered a few years hence, the BMW i8 is a striking and attention-getting design that likely signals one potential future for sports cars: electric power around town, electric-assisted gasoline engines for performance. 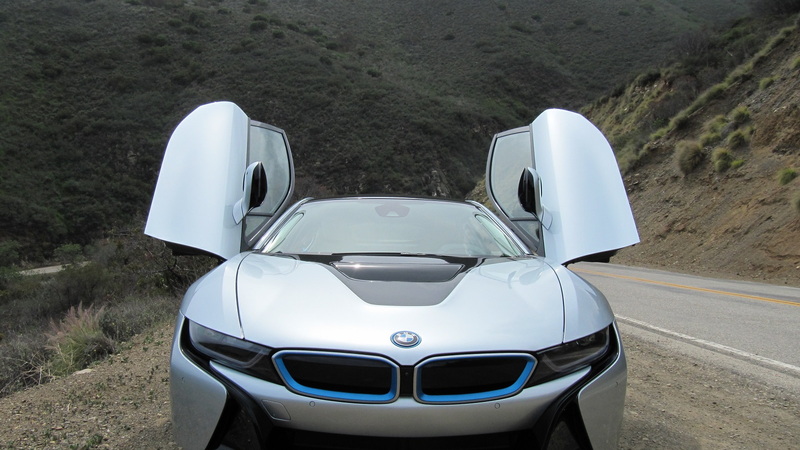 Did we mention how much attention the i8 gets? 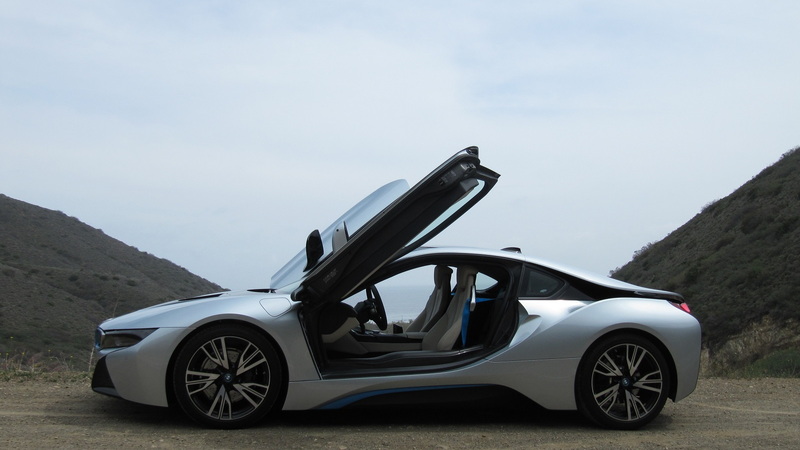 The 2015 BMW i8 will start arriving at selected BMW dealers in September 2014, at which time more information on trim levels will be released.